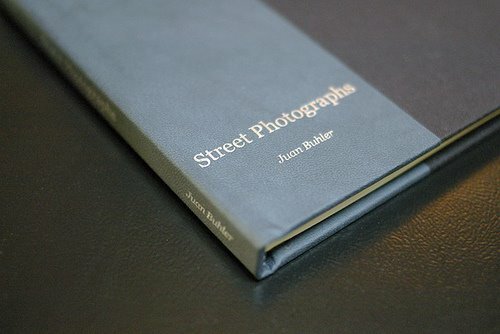 Juan Buhler, an old friend from the Pentax-Discuss Mailing List and the meister of Water Molotov, one of our favorite photo-blogs, has published his first book. It is limited to an edition of only 200 and contains 30 pictures from his April 2006 show at the Anja Van Ditmarsch Gallery in San Francisco. The 8x6.5-inch hardcover book, Street Photographs, is printed on a Xerox Phaser 7750 on acid-free Mohawk Navajo digital paper, bound in black cloth with dark grey faux suede gloved spine. The price is $60, plus $5 shipping anywhere. You can also order the book plus your choice of print from the show for only $100 plus $5 shipping. The 8x12" unmatted limited-edition prints are made on Kodak Endura Metallic, signed by Juan on the verso. I had the pleasure to meet Juan in Buenos Aires last year. It was a really nice day, and a learning experience too. It was amazing to see him shooting in the street in a manner so natural, so zen, that people didn't noticed him, he transformed in a ghost. I also insisted several times to him to get an exhibition, I think his work is superb, top level, so I'm very pleased to know he's moving in the right direction: to world fame! Kudos to Juan! What do you think of that Kodak Metalic paper? Some of my prints on it seem "gimicky," or at least I'm afraid they do.